When people talk about strength training for climbing, most assume that it should be focused primarily on finger strength and our ability to pull. While both of these attributes are definitely important, focusing entirely on them neglects training overall strength in a way that will ensure we are functionally strong throughout our bodies. Ultimately, the best way to do this is with barbell exercises like the squat, dead lift, press. To further make a case for functional strength training as part of climbing training as well as in rehabilitation situations, here’s an article by professional climber, chiropractor, and trainer Natasha Barnes in which she describes exactly why training in this way is so effective both for increasing performance and as a form of injury prevention. The squat, press and deadlift are basic human movements performed everyday by everyone. How else do you get on and off the toilet? Put dishes away in the cabinet? Pick up a basket of laundry? The movements themselves are simple to learn and perfectly safe when performed correctly. The key is to learn to do them correctly! They are executed over the largest effective range of motion and allow us to utilize the most muscle to elicit the greatest strength adaptation. They can be progressively loaded in a measureable way using increments as small as a ½ pound! Now, before you run to the weight room and start throwing weights around, these exercises are only effective when learned and performed properly. While you should definitely look into incorporating cycles of functional strength exercises into your climbing training, find a coach or trainer that can teach you proper form. We cannot stress this point enough. When done correctly these exercises will produce serious strength gains that will benefit your climbing and general quality of life. However, when done incorrectly they are at best ineffective and will likely lead to serious injuries. 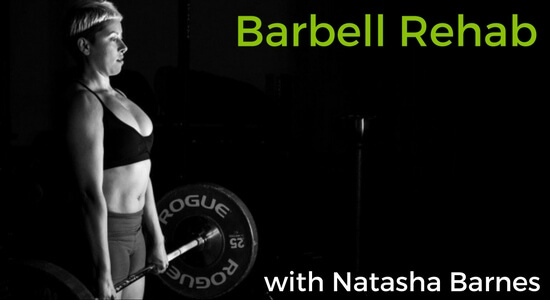 Click through below to read more about why barbell training is so important and effective. While you are there, check out the rest of Natasha’s website natashabarnesclimbing.com. It is full of great articles in which Natasha shares her knowledge as a chiropractor and bodyworker to help climbers specifically.